Can Camping Help Cure Obesity & Depression? Yesteryear: I don’t know about you, but I remember my summers filled exploring the outdoors. My mom kicked us out of the house after breakfast. As soon as our chores were done we disappeared. We spent hours picking blackberries and selling them by the basket. We squeezed mud between our toes in the muddy banks of a local pond. We caught pollywogs in mason jars. We swam in lakes. We camped out under the stars. I brought home loads of red, yellow and orange fall leaves. Once, I sat still enough that a butterfly landed on my shoulder. More often, I was so loud that I scared coveys of quail from their hiding places. We followed deer trails and marveled at the size of trees. We made up games and played make believe….all the while surrounded by nature. At the time, we didn’t realize that we were getting tons of exercise and helping our bodies grow into strong, active, adults. We were learning crucial adult skills: negotiation, reasoning, anger and forgiveness, and how to think for ourselves. Today: The latest study shows that children spend more than 7 hours a day behind some sort of screen, be it TV, computer, cell phones or video games. Whether we approve or not, the digital world is contributing more to the social development of our kids than the corporeal world. While the educational benefits of technology are significant, time lost from outdoor free play has significant side effects. Obesity in children has tripled in the last 30 years. Children stay indoors more than we did, occupy themselves with technology and invest time in virtual realities. Often times, the only outdoor activities dominating children’s schedules are structured activities and team sports. Over-involved, over-protective “helicopter parenting” has become the new norm. Young people can have trouble fitting in socially, live with anxiety and lack self-assurance. These can be directly linked to the absence of “free-play” where executive reasoning and social skills are developed. The Center for Disease Control reported that suicide is the 3rd leading cause of death for 15-24 year olds. Children & Nature Network: Not everyone agrees that there is a link between the lack of outdoor activity and the increasing challenges facing today’s youth. However, most of us can see the connection quite clearly. Movements are happening around the country…trying to connect kids with nature. 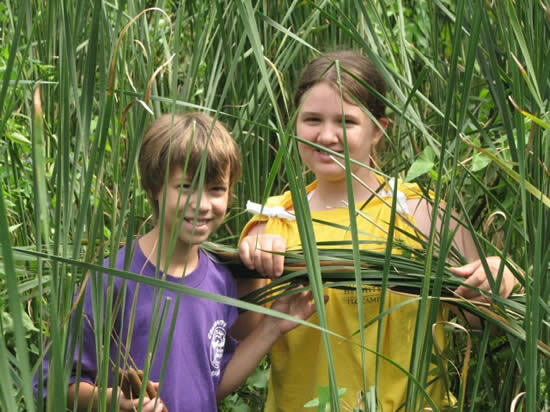 The Children and Nature Network is leading the way, coordinating efforts of other organizations and programs. Founder, Richard Louv, authored Last Child in the Woods and The Nature Principle. These books and the childrenandnature.org website are great starting points in making a positive change for your children or grandchildren. Making a Change Today: We can’t raise our children and grandchildren without today’s technology. However, we can build a love for nature. We can feed their curious minds with outdoor experiences. 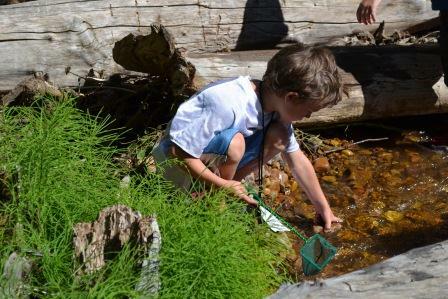 We can encourage them to explore a creek bed, discover a frog amongst the rocks, feel the cool water swirl around their legs, and feel the sun’s warmth on their cheeks. We can make a commitment to the long term mental and physical health of our children. To that end, camp-california.com is filled with destinations to explore, outdoor activities, and of course, places to camp.